What sparked the worst unrest in decades? 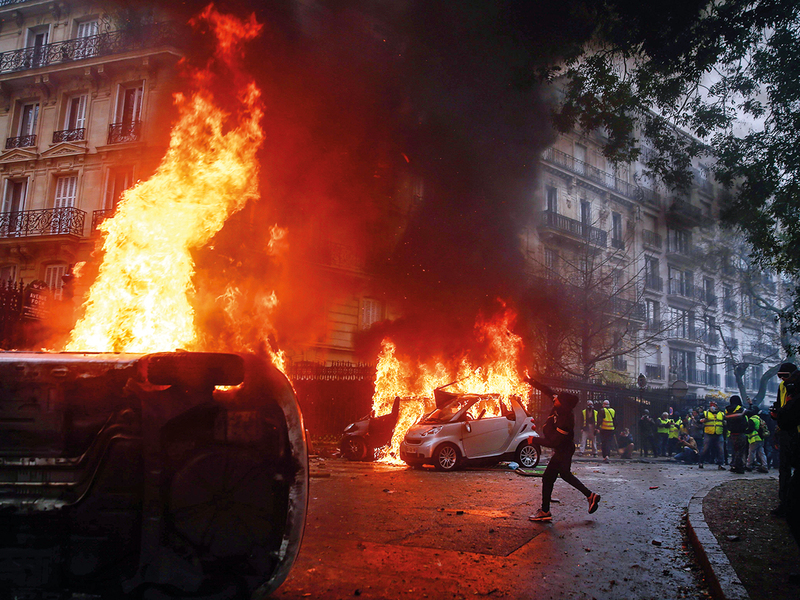 Paris: Thousands of masked protesters fought running battles with the French police in central Paris on Saturday, set fire to cars, banks and houses and burned makeshift barricades on the edges of demonstrations against fuel tax rises, the worst unrest in decades. 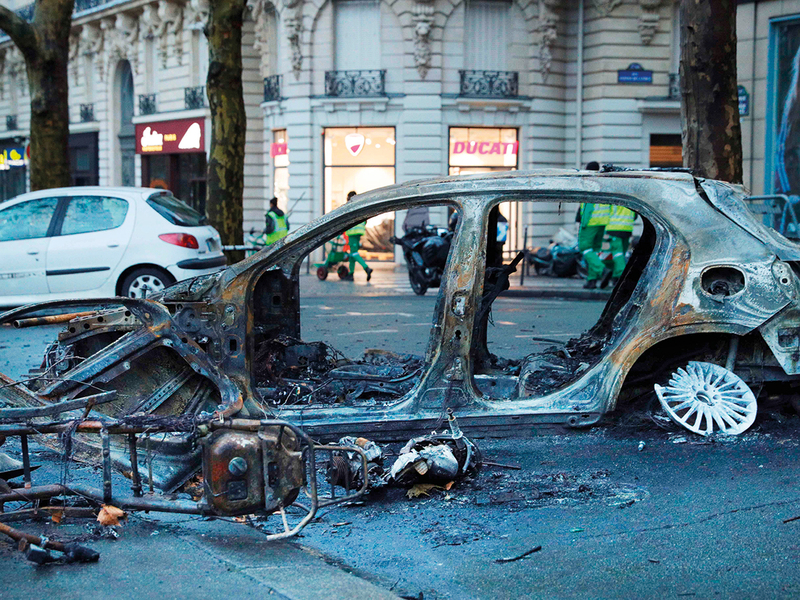 On Sunday, Paris authorities hired extra trucks to begin removing the carcasses of burnt cars from the scorched pavements of some of Paris’s most expensive streets, amid graffiti calling for President Emmanuel Macron to resign. More than 400 people were arrested on Saturday, with over 300 still in police custody on Sunday. More than 130 people were injured, while one protester who was in coma died Sunday. Violence erupted on the margins of anti-fuel tax demonstrations held by the citizens’ protest movement known as the gilets jaunes — or yellow jackets. What is Macron doing about it? On Sunday, Macron immediately went to the Arc de Triomphe after returning to Paris from Argentina to assess the damage from riots. TV images showed the inside of the monument ransacked with a statue of Marianne, a symbol of the French republic, smashed, and graffiti sprawled on the exterior ranging from anti-capitalist slogans to social demands. What are the protesters demanding? 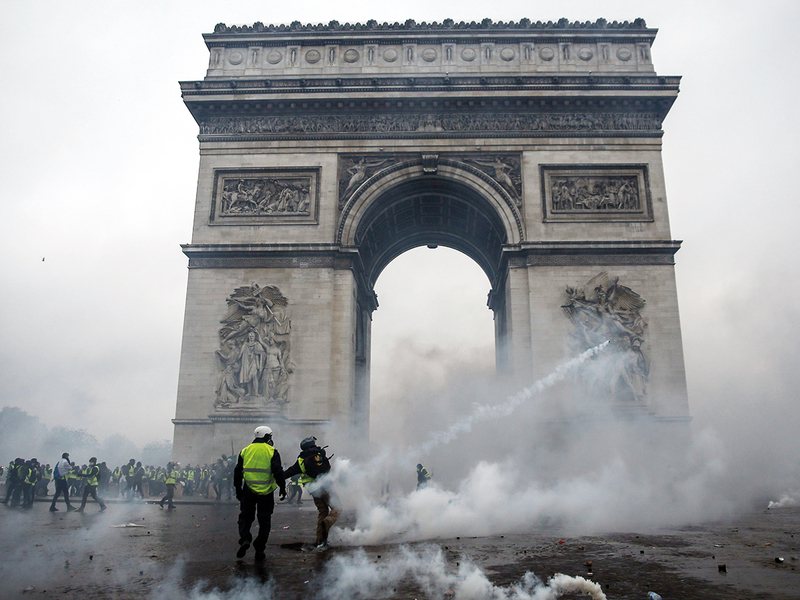 In Paris, riot police started firing the first tear-gas early on Saturday morning, as peaceful gilets jaunes arrived at the Champs Elysees. Slogans painted along Paris’s most expensive streets on Saturday slammed the young, centrist, pro-business president as a symbol of an elite cut off from the people. What steps have police taken? The Champs Elysees was closed to cars and tightly monitored by police, with identity and bag checks taking place as shop workers boarded windows and dismantled outdoor terraces. But peaceful protestors complained that the use of teargas had begun very early in the morning as they attempted to access the Champs Elysees. Some 5,000 peaceful gilets jaunes demonstrators marched down the Champs Elysees at midday on Saturday, some carrying roses, many shouting: “Macron, resign!” and singing the national anthem. How did peaceful protests turn into violent riots? By early afternoon, the Arc de Triomphe was surrounded by masked protestors fighting running battles with police. The interior minister Christophe Castaner said thousands of troublemakers unconnected to the peaceful demonstrations had deliberately come to “pillage, smash, steal, wound and even kill”. He called them rioters who were “professionals at causing disorder”. Authorities stressed the difference between peaceful protesters who marched along some Paris streets on Saturday morning, singing and waving flags, and the violent clashes with masked men which followed. How did the riots play out in the evening? 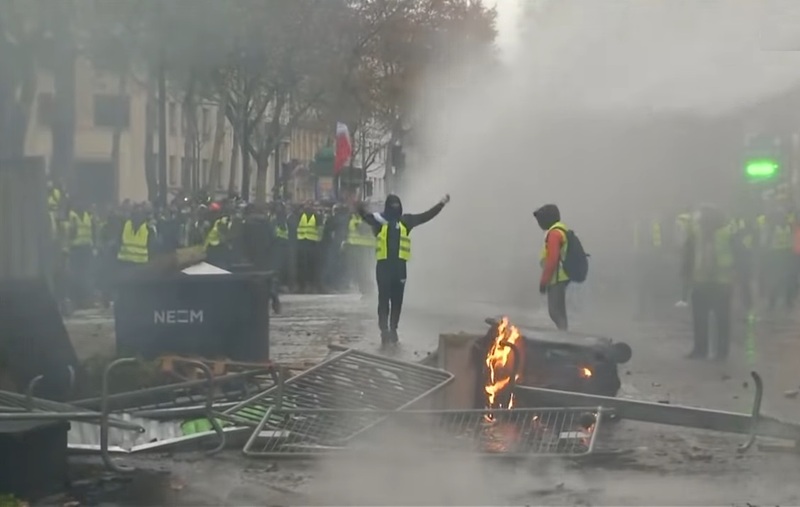 Near the Arc de Triomphe, one of Paris’s most symbolic monuments, masked men burned barricades, set fire to buildings, smashed fences and torched luxury cars as riot police fired teargas and water-cannon. Anti-Macron graffiti was scrawled over the Arc de Triomphe near the tomb of the unknown soldier and protestors then burst into the 19th century monument smashing up its lower floors, destroying the gift shop and smashing up statues, before climbing onto the roof. Then, by early evening, rioters spread around Paris in a game of cat and mouse with police. Luxury department stores on Boulevard Haussmann were evacuated and convenience stores were pillaged. Near the Louvre, metal grills were ripped down at the Tuileries Garden and fires were started. On the Place Vendome, a hub of luxury jewellery shops and designer stores, rioters smashed windows and built barricades. What is the aftermath of the riots? New figures released from the Paris police service showed that 412 people were arrested on Saturday and 378 were still in custody. A total of 133 had been injured, including 23 members of the security forces who battled rioters. In a fresh incident on Sunday morning, a motorway pay booth was set on fire by arsonists in southern France near the city of Narbonne. The main north-south motorway in eastern France, the A6, was also blocked by protesters near the city of Lyon on Sunday. The capital was calm, however, but as groups of workers moved around cleaning up the mess from the previous day, the scale of the destruction became clear. • The so-calle "yellow vest” anti-government protests have swept France over the last fortnight, sparked initially by a rise in taxes on diesel. • The Yellow Vests are a grass roots movement with no formal leaders and a wide range of demands. Some representatives have also insisted on public talks broadcast on TV. • The movement has since morphed into a broad opposition front to President Emmanuel Macron, a 40-year-old pro-business centrist elected in May 2017. • Violent anarchist and far-right groups have since infiltrated it and are thought to be behind Saturday’s clashes.